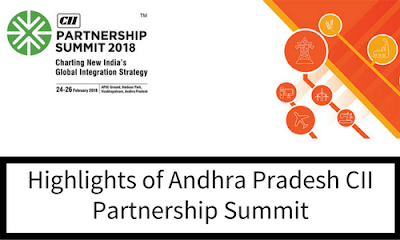 Andhra Pradesh CII (Confederation of Indian Industry) Partnership Summit-2018 is the third edition of Partnership summit. First and second summits were held in 2016 and 2017 respectively. 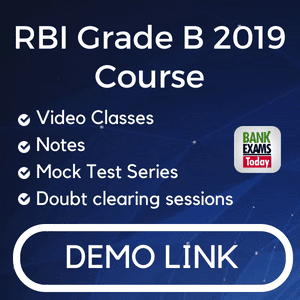 The Confederation of Indian Industry, and The Department of Industrial Policy and Promotion, Ministry of Commerce and Industry. The main aim of three-day CII Partnership Summit and Sunrise Andhra Pradesh Investment Meet was to showcase investment opportunities in the State in the food processing, automobile, aerospace and defence, hardware, tourism, infrastructure, and other sectors. The energy sector netted the highest investment proposals worth Rs 1,11,921 crore from 34 MoUs. Adani group chairman Gautam Adani has announced setting up a Greenfield seaport and multimodel logistics park at Bhavanapadu in Srikakulam district of Andhra Pradesh. The Andhra Pradesh government has also signed agreement with Google to connect some 30,000 panchayats with 25,000 wifi hotspots. It is located in the southeastern coast of India and is a natural gateway to East and South East Asia. Andhra Pradesh has the second longest coastline of 974 Kms. It is the eight largest states in terms of area. AP Single Desk Portal which is for granting industrial clearances in 21 working days as a part of Ease of Doing business designated as a best practice by World Bank.